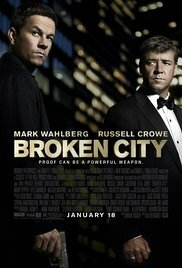 “Broken City” is complicated political crime story. Despite the interesting cast with Russell Crowe, Mark Wahlberg and Catherine Zeta-Jones (the latter for the beautiful packaging … not the content), I thought this was an annoying clichéd film that has all the characteristics of a loose ship on the ocean: rudderless, going in all directions and no clear end goal. All stereotypes were present : a corrupt mayor (beautifully portrayed by Russell Crowe and the only bright spot in this film), an ex-policeman ex-alcoholic who, due to a mistake in the past and protected by the corrupt politician, became a P.I. (Mark Wahlberg on auto-pilot) and the beautiful lonely and unloved woman of the politician (Catherine Zeta-Jones of course). The private detective has to investigate the allegedly cheating of the politician’s wife (compensation for the political protection) and ends up with the murder of the mayor’s political rival. Throw in a document that proves that the mayor is corrupt and that’s about it. I’ve watched it and … uhm … I can’t remember anything anymore already !